The best that can be said about the proposed State Conversion Bill is that it is destined to be thrown away into the waste bin that Israeli politics has designated for the recommendations of committees appointed mostly to put out political fires. The proposal is not only a slap in the face, disguised with a smile, to the non-Orthodox streams, but it also angers the ultra-Orthodox (Haredi) politicians (“This will not be, we will not allow this bill to pass, there is a limit, this threatens Judaism”). This unique combination ensures a “stillbirth” for a proposal that should never have come about. Moshe Nissim, the author, himself revealed his true intentions in an interview to a Haredi media outlet: no less than this was intended to assist those in need of conversion, it is meant to block recognition of Israeli Reform (and Conservative) conversions and to preempt a Supreme Court ruling to this effect! Special focus is necessary as to how Diaspora Jewry and the major Jewish streams should respond to the bill. The starting point seems praiseworthy. It is the desire to widen the gates of conversions in Israel and better address the national and historical challenge created by a reality in which some 400,000 Israeli citizens (members of families from the former FSU) are registered in the population registry as “Other.” The reason is that their mothers are not halachically Jewish, meaning that none of them can legally marry in Israel. Moreover, the number grows annually by approximately 10,000, whether by birth or through aliyah. On the other hand, the conversion options allowed by the Chief Rabbinate, including the special beitei din established to ease the process, yield less than 2,000 conversions annually. This is a drop in the ocean; a colossal and predictable failure of the monopoly granted to the increasingly fundamentalist Chief Rabbinate. The necessary solution is to encourage multiple conversion options along a spectrum of channels widely accepted among the Jewish people, fitting the faith and practices of the individual converts. This is supported by the overwhelming majority of the Israeli public, as numerous polls conducted by Hiddush and others indicate. Unfortunately, rather than follow this path, the Nissim proposal preserves the Orthodox monopoly. It perpetuates the masquerade ball in which converts are pressured to fraudulently commit to halachic Orthodox observances. Moshe Nissim understands that leaving conversions to the Chief Rabbinate is a kiss of death to the expansion of the scope of conversion. Therefore, he reintroduces the concept of an exclusive “State Conversion Authority.” His proposal weakens the Chief Rabbinate’s stranglehold and enables the appointments of City Rabbis (all Orthodox) as members of conversion courts. Clearly, thinking that this will bring the necessary breakthrough is merely an illusion. The bill erects a barrier that would prevent state recognition not only of Reform and Conservative conversions performed in Israel, but also of conversions done via ultra-Orthodox courts and recently established independent Modern Orthodox courts. The proposal includes a misleading clause, according to which it would be presumably possible to continue registering Israeli Reform and Conservative conversions in the population registry, but it is doubtful that with this bill, the legal basis upon which this was done in the past would remain. Nissim attempts to present his initiative as an olive branch to the non-Orthodox streams whose ire regarding their conversions brought about his committee in the first place. In truth, the olive branch is merely a plastic replica. Nissim attempts to present his initiative as an olive branch to the non-Orthodox streams whose ire regarding their conversions brought about his committee in the first place. In truth, the olive branch is merely a plastic replica. Worse yet, it’s an attempt to “divide and conquer.” Nissim apparently believes that if he maintains the recognition of non-Orthodox conversions performed overseas, and throws the Movements a bone in the form of symbolic representation on the Conversion Authority, then they will be willing to ignore the blocking of non-Orthodox conversions in Israel. The main interest of the Haredi parties is to eliminate the portals to Judaism offered by Modern Orthodoxy and the non-Orthodoxy streams. Similarly, their rejection of Modern Orthodox conversions is uniform. The Chief Rabbis reacted to them, saying, “One cannot make pork kosher.” The International Rabbinic Committee on Conversion: “These rabbis should be ashamed to call this ‘conversion according to Halacha.’” No one should be deluded to believe that their objections are rooted in loyalty to the Chief Rabbinate. 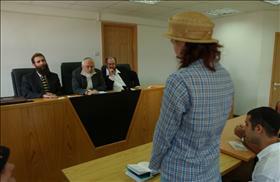 The Haredi are the last to subject themselves to the authority of the Chief Rabbinate. They have their own respective supreme rabbinic bodies, and what is common to them all is that none of them would be willing to eat food certified as kosher by the Chief Rabbinate! Clearly, this proposal will not ripen beyond the pages of Nissim’s report. The question is, what’s the lesson that Diaspora Jewish leadership should learn? It would not suffice to sigh in relief at the kill contract taken out by the ultra-Orthodox parties and the Chief Rabbinate against the proposal. The Shas party has already announced its demand to return to its original conversion bill, which was the reason for creating Nissim’s committee. It is important to move from defense to offense: 1. To denounce this shameful attempt at “divide and conquer” and to make it clear that the international religious Movements do not see a difference between the status of their overseas converts and those who convert in Israel; 2. The Movements should announce that they will no longer settle for limited civil recognition (Law of Return and population registry) but rather demand that all converts enjoy the right to marry and establish a family in Israel; 3. Collaboration among the religious streams — including Modern Orthodoxy, which is also excluded by the Chief Rabbinate — must grow, aimed at advancing religious freedom and equality for all in Israel; 4. A common front must be actively pursued with other communal bodies such as the Jewish Federations and the American Jewish Committee. The proposed bill perpetuates and even strengthens the Orthodox monopoly over conversions in Israel. It does not reflect the pluralistic conversion tradition that has existed in Judaism since ancient times; It does it address the principles of religious freedom and equality promised in Israel’s Declaration of Independence, nor does it respond to the historic national challenge of opening the gates wide for conversion. The way to move forward is in the spirit of the “Vision Statement on Israel as a Jewish and Democratic State,” which has already been endorsed by rabbis and leaders of divergent streams and political views. It offers a real, substantive, and holistic solution to the challenges of religious freedom in Israel.